Space-Run Artists: Art Activism and Urban Conflict in Contemporary Barcelona was first published in Fillip 7 in Winter 2008. In effect, the Strategic Plan for Culture gives official recognition for the first time to views that had emerged in the early 1990s in opposition to what is known as the Barcelona model. The term “Barcelona model” is used specifically to describe the consequences of urban planning policy since the early 1980s and, more generally, the action of city hall as a whole. For the model’s many admirers this policy has turned Barcelona into “the outstanding example of a certain way of improving cities…even globally.”5 Strong architectural and design values have been a common feature, bolstering civic pride while showcasing the city—and its architects—to outsiders. In the early years, projects were conceived as modest, low-impact interventions into the local cityscape. In contrast, from the build-up to the 1992 Olympic Games to the present (with the 2004 Culture Forum in between), Barcelona planning has been typified by ambitious, large-scale projects that have been less respectful in preserving historical working class neighbourhoods and industrial heritage.6 As planning initiatives could only be carried out in a climate of public consensus, politicians found it necessary to market their idea (or brand identity) of Barcelona to residents and the international community through enthusiastic advertising and marketing campaigns.7 Logically enough, not everyone bought in. In the cultural sphere criticism of the Barcelona model centred on the mechanisms used to manufacture consent, the excessive role of city hall in controlling cultural content, and municipal neglect of the needs of artistic production, much of it taking place in former factories. Only in recent years, and to a considerable degree in response to the debate over Can Ricart, has the city widened its list of protected industrial structures. The idea, then, is to turn many of these sites into cultural resource centres as part of the Strategic Plan for Culture. Such a strict critical take at a time when artist-run initiatives were just getting off the ground could be seen to be lacking in pragmatism; better a slew of “theoretically deficient” independent venues than none at all, one might argue. Yet for all its apparently impractical rigour, Badia’s proposal for alterespais (alter-spaces), able to continually renew their critical edge through short-lived, ubiquitous, or fragmentary solutions, would in fact anticipate much of what was to come. Literally dozens of independent cultural projects that have appeared in Barcelona since the 1990s would pick up on this idea of the alter-space, overtly citing theoretical motives behind the choice to work outside or beyond a single, stable venue. While some would operate as a kind of “cultural guerrilla activity,”9 the majority have sought some form of détente with the public administration. One of Barcelona Taller’s legacies was to popularize a slogan still heard today: ciutat aparador—ciutat taller (showcase city—workshop city), which contrasts competing visions of how a metropolis might express its cultural identity. Alongside parallel initiatives like Tallers Oberts, an artists’ open studios project begun in 1993,10 associations like Barcelona Taller had a role in shifting awareness at city hall, making it possible to set up the Hangar artist resource centre in 1997, inside the then-thriving premises of Can Ricart.11 As difficult as it may be to categorize, Barcelona Taller exemplifies a type of collective cultural entity that has reappeared in the city over the years. It is typical for these groups to organize their activities through non-hierarchical participatory assemblies, a model that nostalgically refers back to the methods of 1930s anarchist and libertarian organizations that were repressed by the Franco regime. Many of the cultural groups active in the Save Can Ricart platform are manifestations of this way of working. The political and social activism of the artists of Nau21 is indicative of the complexity of their vision of the public domain. The parallel project of Straddle has focused more on urban planning issues and alternative culture, organizing debates through their Open Fridays. A related project dedicated to issues of public art and urban space is Sitesize, run by the artists Joan Vila-Puig and Elvira Pujol. As with many other similarly structured initiatives, it is difficult to make a clear distinction between Sitesize’s artistic projects and their participatory research programs, like Repensar Barcelona (Rethinking Barcelona). A different case was 22a, a collective of ten artists and curators who decided to close their critically successful gallery and take their project into the urban space. 22a took its name from the street address of an industrial warehouse in Poble Nou, where some of the founders had their studios and where the gallery was first set up in 1996. From the start the name was the cause of a juicy confusion, as the municipal plan to rehabilitate nearby industrial sites for the creation of a high-tech cluster was called 22@ (after the district’s postal code). Under pressure from real estate developers, they moved into a small space in the Poble Sec neighbourhood (1998–2002). The gallery’s programming earned it an award from the Catalan art critic’s association in 2001. It was at this point that the group, citing the physical and conceptual limitations of “conventional exhibition spaces” (referring self-critically to their own), began a new phase under the rubric space invaders. “The new cycle,” wrote 22a at the time, “is motivated by the desire to experiment with new strategies to exhibit and promote contemporary art, beyond the restrictions imposed by the so-called “white cube,” and to reflect upon the status of action and the artistic object in the present day.” Projects included Norwegian artist Anne-Britt Rage’s Fortress Europe, an exhibit in a private residence called Shared Flat, and the travelling postcard display Moments and Monuments. The group disbanded in 2006 as members pursued individual projects. A more recent variation on the pattern has been implemented at Saladestar, an artist-run space founded in the Gràcia district in 2003. After doing regular programming for three years, in 2007 the gallery decided to rent out its exhibition space and do all its own programming outside of it. Calling their current program Nomad, Saladestar has participated in the UND#2 festival in Karlsruhe with an exhibit of artist suitcases, has organized art interventions in private apartments, and is currently developing a juried public art project (unimaginatively entitled Public) that will carry over into 2008. While city hall insists on commissioning rather conventional public sculpture, projects like Public encourage work that blends social sculpture with relational aesthetics. Of the numerous art projects that have dealt broadly and critically with urban conflict in Barcelona since the mid-1990s, two stand out particularly. Both Hospital 106, 4t, 1a (1995–2005) and Occupied Territories (1996–2000) were developed over relatively long periods and involved intense collaboration with residents and neighbourhood groups; both were shown in phases and through different formats in alternative and conventional exhibition sites. The former was centred on the urban core, the latter the periphery, though both addressed marginality, concealed forms of working class creativity, and the implicit violence of urban change. In Hospital 106 Isabel Banal and Jordi Canudas documented the process whereby the resident of an apartment on Hospital Street in the downtown Raval neighbourhood was evicted and the block demolished as part of a plan to cut a wide swath through the zone. 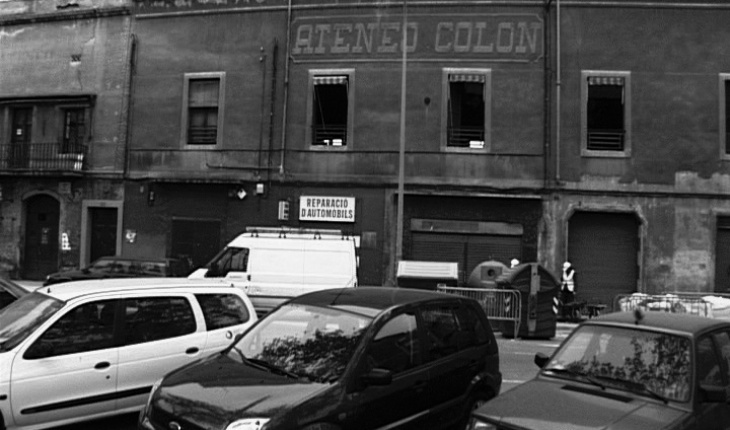 With the creation of the polemical Rambla del Raval, the street address no longer exists. The many phases of the project—including cataloguing and redistributing abandoned personal belongings, cartographically laying over past and present street plans, documenting press reactions, or entering into dialogue with residents— were displayed through exhibits and events in studios, established galleries, and neighbourhood associations, and on local buses or through poster campaigns. The catalogue that closes off the project is available in English as Hospital 106, 4t, 1a: The Place and the Time. With Occupied Territories, Ramon Parramón focused on a forgotten or invisible part of the city, the zone on either side of the Besós River inhabited since the 1960s by working class immigrants, mostly from Andalusia. The exhibited version of the project included textual, cartographic, and video documentation, including interviews with residents, social workers, and local politicians. The project featured a fascinating study of illegal vegetable gardens occupying unclaimed space near the river banks. In some cases these gardens are accompanied by self-built structures that have become permanent residences (literally thousands of similar examples still exist in metropolitan Barcelona, though they are disappearing). A first phase of the project was shown in a municipally organized exhibit on new urban planning in 1999, with the definitive closing installation held at the Centre d’Art Santa Mònica in 2000–01. Since 2001, Parramón has been the director of one of the most innovative public art projects in Spain, Idensitat. Finally, it is worth mentioning a large group show held at the Tàpies Foundation in 2004; Tour-isms: The Defeat of Dissent, co-curated by Jorge Luis Marzo, Montse Romaní, and foundation director Nuria Enguita. Specifically conceived to coincide with the Culture Forum held that year, the project sought to provide an in-depth analysis of international tourism and its meaning for globalized urban identity. By looking at both the “tourist subject” and “touristified” places, Tour-isms dealt transversally with issues that have been important in Spain since the 1960s but that have become particularly pressing in the light of environmentally unsustainable development and the changing focus of public policy away from the interests of residents and in favour of tourists and business travellers. The promotion of culturally hip, weekend tourism from other European cities (reinforced by low-cost airfares) has been an essential factor in selling the success of the Barcelona model to local residents (“if they come, it must be good”). Along with art, film, and video, the project included alternative sightseeing in the city, such as routes tracing the history of anarchism or working-class neighbourhoods. Perhaps the most interesting aspect of Tour-isms was its role in addressing the idea that contemporary tourism had turned the admired Barcelona model into a brand. The new image of Barcelona was something to be meticulously filtered and neatly packaged in order to attract high-end tourists and international capital. Though the concept of urban branding is not new, in the early part of the decade, academics and culture critics looking at Barcelona had begun to apply the ideas of urban geographers and theorists like David Harvey,12 Saskia Sassen, and others. The work of Mari Paz Balibrea13 and Josep Maria Montaner,14 along with publications like Barcelona Marca Registrada15 (Barcelona registered trademark) were indicative of a shift toward the view that the model that had once been proudly promulgated as an urban success story, something to be emulated by other cities, had now been reduced to the status of marketable product. It would thus be possible to comprehend the growing degree of estrangement between the city of Barcelona and its own citizens, especially when it came to planning decisions. The exemplary campaign to save Can Ricart would not have been possible without the perception that a paradigm shift was possible in Barcelona society. Yet the new challenge, given the unlikelihood the Barcelona model will ever be fully revoked, is to find a way to widen its circle, to reform, rework, or expand it in such a way that traditional neighbourhoods, industrial heritage, and cultural production might find a comfort zone within it. ↩ 1. The case of Can Ricart is the subject of a documentary film by video artist Jacobo Sucari, The Struggle for Urban Space (2007). ↩2. In Barcelona there are over two thousand squatters set up in some three hundred buildings. A few dozen groups have a visible profile, organizing cultural and political events and protesting for accessible housing despite substantial police-led evictions. ↩ 3. See a clip of the event online at http://lamakabra.org/joomla. ↩ 4. Pla estratègic de cultura de Barcelona: Nous accents 2006 (Barcelona: Ajuntament de Barcelona, 2006), 63. The plan mirrors the Xarxa d’Espais de Producció d’Arts Visuals de Catalunya, a network of contemporary art production centres in Catalonia. ↩5. Tim Marshall, ed., Transforming Barcelona: The Renewal of a European Metropolis (London: Routledge, 2003), 1. The architect Richard Rogers has described Barcelona as “the jewel in the crown of urban regeneration.” Quoted in Melissa Rossi, “The Barcelona Model,” Newsweek International, 2 February 2004. Equally adulatory is Peter G. Rowe, Building Barcelona: The Second Renaixença (Barcelona: Actar/Barcelona Regional, 2006). ↩6. The Olympic Village itself, a residential development in Poble Nou, left only the odd chimney to refer to the area’s industrial past. Only a few artists dealt critically with the Olympic transformations, including Martí Llorens in his Poble Nou-Barcelona Series (1987–89) and Ian Wallace’s Construction Site (Barcelona Series I–V) (1991). ↩7. For an analysis of the politics of the Barcelona model, see Donald McNeill, Urban Change and the European Left: Tales from the New Barcelona (London: Routledge, 1999). ↩8. Tere Badia, “El fet X: de l’als alterespais,” in De Calor 1 (Barcelona, 1993), 12–13 (my translation). Badia backed her critique of the alternative space with Canadian sources, in particular the Keith Wallace essay in Vancouver Anthology (Vancouver: Talonbooks, 1991) and Barbara Fischer’s Decalog: YYZ 1979–1989 (Toronto: YYZ Books, 1992). MACBA Universidad Internacional de Andalucia, 2005), 190 (my translation). Available online at http://arteleku.net/desacuerdos/index.jsp. ↩10. In 1994, Tallers Oberts organized a conference at the College of Architects featuring talks on cultural squats and a lecture on industrial heritage. On the evolution of artist studios in Barcelona, see my “The Decline of Artistic Production in Barcelona’s Raval,” in Isabel Banal and Jordi Canudas, Hospital 106, 4t 1a: The Place and the Time (Barcelona: Actar Editorial, 2006). ↩11. Hangar was originally funded entirely by Barcelona city hall, which paid the rent on its Can Ricart building. This absolute financial dependency was a possible reason for the “soft” or “passive” political stance of the Association of Visual Artists of Catalonia, who run the space, in the face of the massive elimination of artist studio space in the city in the 1990s. Only recently, as the Association has ensured a wider funding base for Hangar, has it become more outspoken about the lack of studio space. ↩12. Harvey deals specifically with the “mercantilization” of culture and the “Disneyfication” of Barcelona in David Harvey and Neil Smith, Capital financiero, propiedad inmobiliaria y cultura (Barcelona: MACBA/UAB, 2005). ↩13. See Mari Paz Balibrea, “Urbanism, culture, and the post-industrial city: Challenging the “Barcelona Model,” in Tim Marshall, Transforming Barcelona, 205–224; and “The Brand and the Past: Strategies of the Struggle for Social Space in Postindustrial Barcelona,” in Producta50 (Barcelona: Generalitat de Catalunya, 2007), 30–31. Available online at http://ypsite.net/pdfs/productaang.pdf. ↩14. Josep Maria Montaner, “La evolución del modelo Barcelona (1979–2002),” in Jordi Borja and Zaida Muxí, eds., Urbanismo en el siglo XXI: Bilbao, Madrid, Valencia, Barcelona (Barcelona: Edicions UPC, 2004), 203–220. ↩15. PePa, eds., Barcelona Marca Registrada (Barcelona: Virus, 2004). Most chapters are available in Spanish at http://barcelonamarcaregistrada.com. Image: Jacobo Sucari, still from The Struggle for Urban Space, 2007. 59-minutes. Betacam. Courtesy of the artist.